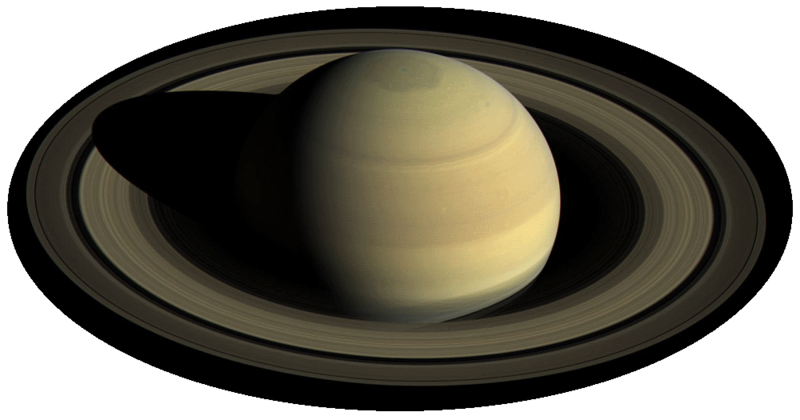 Saturn is the sixth planet from the Sun and the second largest in the Solar System, after Jupiter, at almost nine times the diameter of the Earth. Like Jupiter it is a huge ball of Hydrogen gas with no solid surface to stand on. It is also the most recognizable planet in our Solar System with its magnificent rings. This natural color view captured by Cassini from a distance of approximately one million kilometers is the best image we will have of Saturn for a long time. This true color image was taken from a distance of about 21 million kilometers. The pastel and yellow hues on the planet reveal many contrasting bright and darker bands in both hemispheres of Saturn's weather system. A view of Saturn from just over 5 million kilometers with a new perspctive looking back towards the sun. The shadow of Saturn can be seen on the rings, and Saturn can be seen through the gaps in the rings. Saturn is visible to the unaided eye as a bright yellowish wandering star along the ecliptic. Many cultures have tracked its path across the sky as one of the five wanderers (Mercury, Venus, Mars, Jupiter and Saturn).